Glamis is located in East London. I took the Tube and an Overground train to get there. I debarked at the Shadwell station and took a short walk to Glamis Street. As I turned the corner I immediately saw the playground – a bright blaze of colors and an array of tall climbing structures. A child’s paradise in the middle of housing and businesses! Glamis is entirely outdoors and is open 50 weeks of the year. The playground is open from 3:15 to 7 PM on Monday, Tuesday and Friday, and from 12 to 6 PM on Saturday. There are extended hours for school breaks and holidays. Mondays are open for girls only. The facility offers a wide variety of play structures, climbing apparatus, a water feature, many swings, a small garden, and a fire pit. I had the opportunity to meet two of the deputy directors of the playground. One had been with the organization for more than 10 years (and had attended it as a child also); the other for four years. Both were passionate about the facility and what it offered to the community. They have 700 children from age 6 to 16 who visit the playground regularly each year. 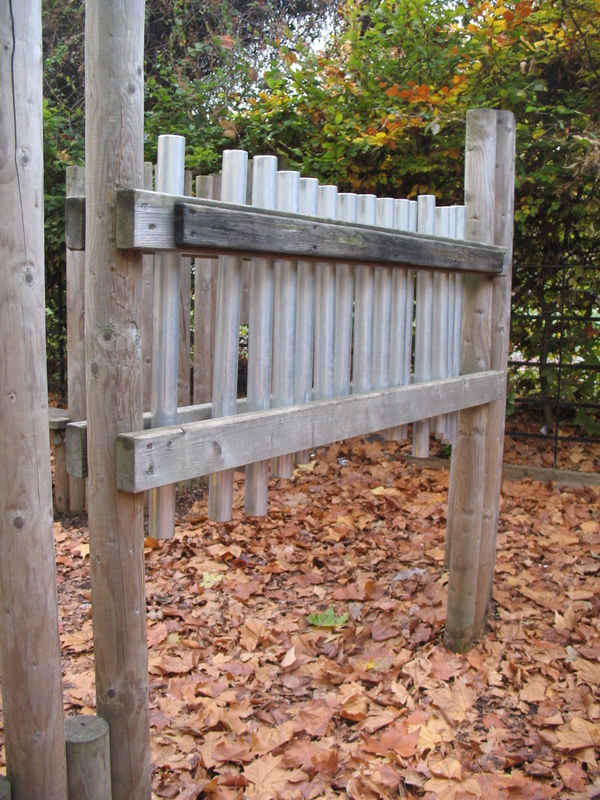 The play that happens at the playground is initiated by the children themselves. If a child wants to build a garden, they rummage for tools and materials and build it; if they want to do artwork, the get materials from the art area and create away. All is done under the watchful eyes of the playworkers, but the kids take the lead and the adults help only when needed or required. Each day they prepare hot food on the fire pit. All the food is vegetarian so that it complies with their community’s dietary requirements. The girls-only day was established to meet the needs of their community as well. The playground is situated in an area with a high Muslim population and the girls-only day was initially offered as a way to get more involvement from that community. They have found it to be effective – for all the girls in the community. In general, the playground attracts more boys than girls, so each Monday girls are free to play without being over-run by the boys. The playground is funded largely by their local community council (similar to our city councils) as well as by donations and sponsorships. 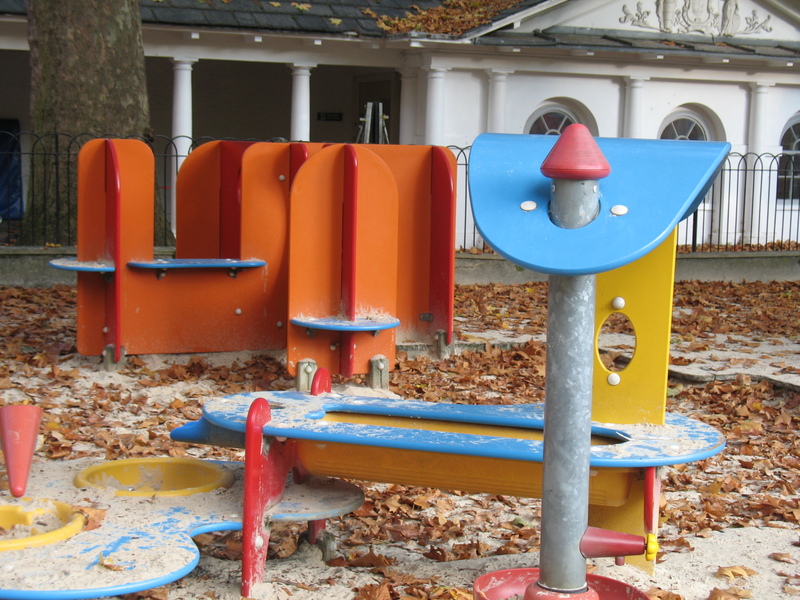 Like in the States, the economic downturn has taken its toll on children’s programs and playground funding has been cut. Glamis lost a few positions in the process, and were forced to go from six days of operation to the four they currently operate. Despite the difficulties, they are carrying on, determined to make Glamis an oasis for children, and the most exciting adventure playground in the city. 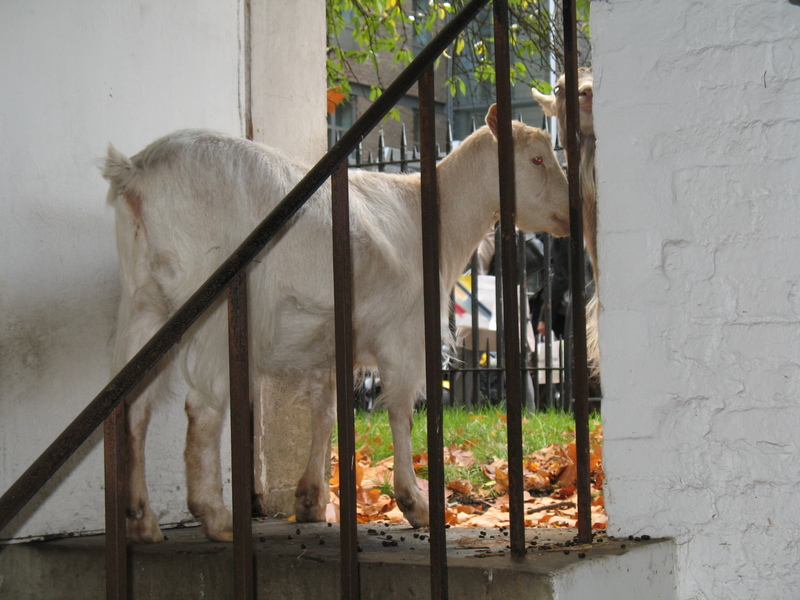 I stumbled upon Coram’s Fields one day as I was wandering the streets of London and heard the familiar sound of children playing and smelled the familiar scent of goats! Like Fairytale Town, adults may not enter Corman’s Fields without a child. Childless, I couldn’t visit that day, so I made arrangements to visit a few weeks later. As I made my way to the Fields again, I heard another familiar sound – the sound of leaf blowers, and saw a familiar sight – people setting up for an event. I checked in at the front gate and met with the deputy director for a tour and a visit. 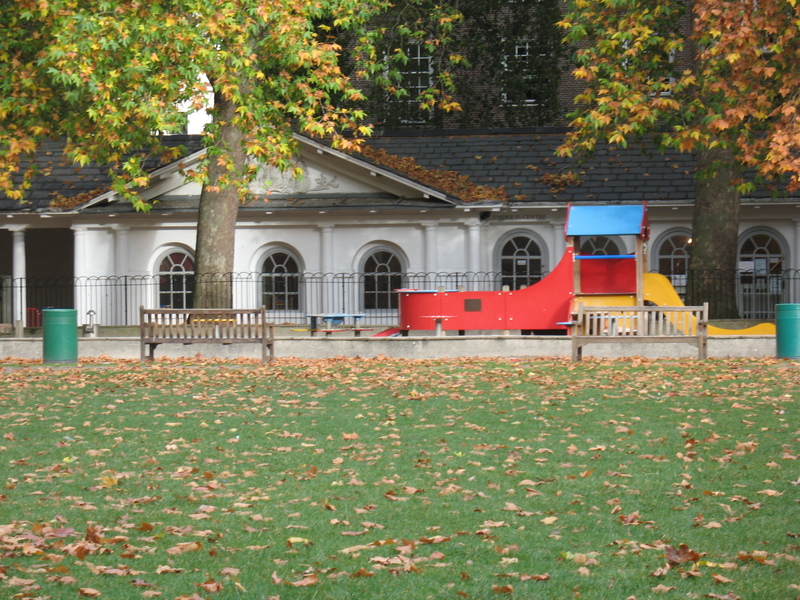 Coram’s Fields is set up like a town square with buildings surrounding the play areas in the center. The buildings house the children’s and youth centers, offices, meeting rooms, café, animal pens and toilet rooms. The animal collection includes chickens, rabbits, guinea pigs, birds, sheep and goats. The playgrounds are broken into two areas, one for the under 5s and one for over 5s with a big grassy field in between. 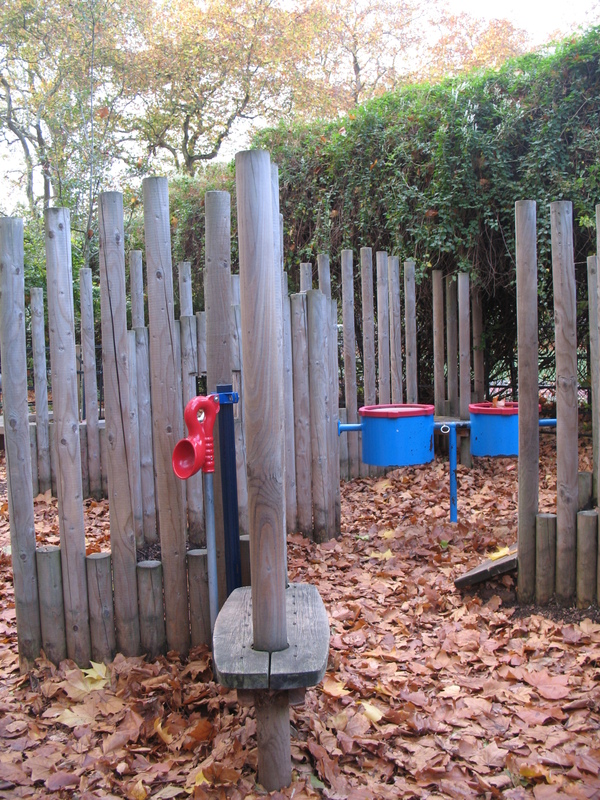 The under 5 area has many small play structures within a large sandbox. Bouncy animals, a water feature, play tables and climbing apparatus let young children build physical skills and confidence whilst engaging their imaginations with creative play – mostly with sand. 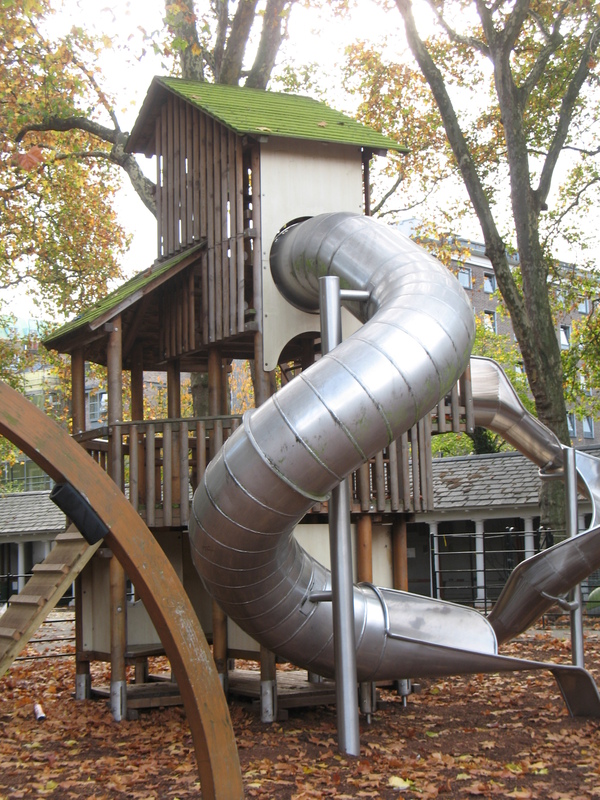 The over 5 area includes two zip lines, numerous swings, a musical play area, balancing beams, and a large climbing structure with slides – plenty of activities to engage a child’s body, mind and imagination. Children of all ages explore both areas. The 10-year old I was watching had just as much fun making sand-cakes in the under 5 area as she did on the zip line in the over 5 space. 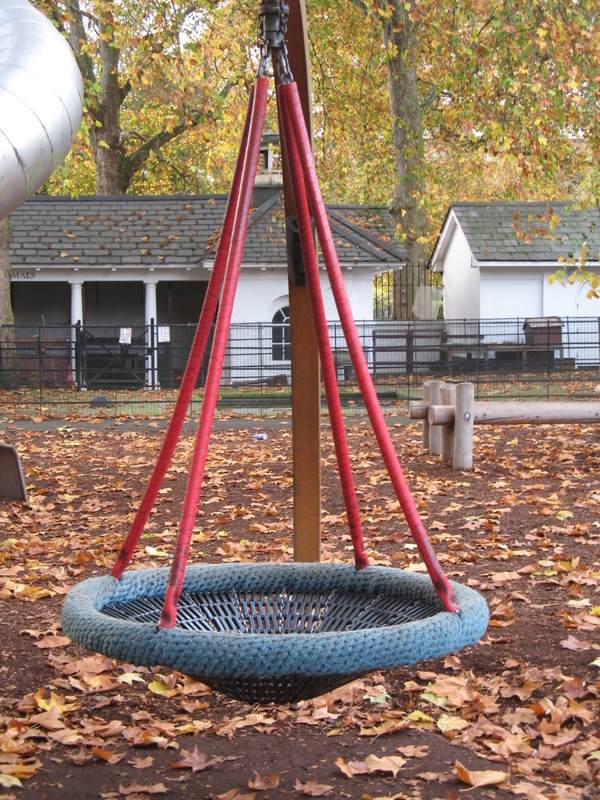 Admission to Coram’s Field is free of charge, and they are open daily except for December 25 and 26. It is the hub of the community and offers dance, yoga, music and sports lessons as well as meeting space for scouts, orchestras, dance clubs and other charities. It also offers outdoor festivals and events. (The event they were preparing for when I arrived was a fireworks display for Bonfire Night.) The activities they offer, particularly in the children and youth centers, are curriculum based. They have regular inspections of the playground, animals and children’s centers. A total of 30 staff, comprised mostly of child care workers as well as 5 groundskeepers, 3 sports coordinators, and 5 administrators implement the programs and operate the property. I was extremely impressed by the facility, staff and services they offered. While not as bad as it was hundreds of years ago when Coram began the hospital, the community surrounding the Fields is still pretty impoverished with 30 percent living below the poverty line. Not surprisingly, funding is one of the Fields’ biggest challenges. While they have many funding streams including the borough council (our city council), sport field rentals, and charitable gifts, the economic downturn and changes in how the council funds children’s programs have had their impact. In true British fashion, the good people at Coram’s Fields keep calm and carry on, providing excellent services to their community and remaining a safe haven for children. Mr. Coram would be proud that his vision of a place for ‘maintenance and education’ of children lives on. Policies around funding for children’s programs and education in general have been highlighted in the news lately. A demonstration happened yesterday and culminated at St. Paul’s Cathedral where the tent city is set up. More on that next round. Wonderful report, as usual and it is fascinating that you are viewing places that have similar challenges to the ones facing you and your staff/board in the States. I look forward to the photos taken in better light when you are able to post the same. It is great that you are able to meet and commune with colleagues and I am confident that some of them will come and visit with you in Sacramento when opportunity permits. I hope they do visit!